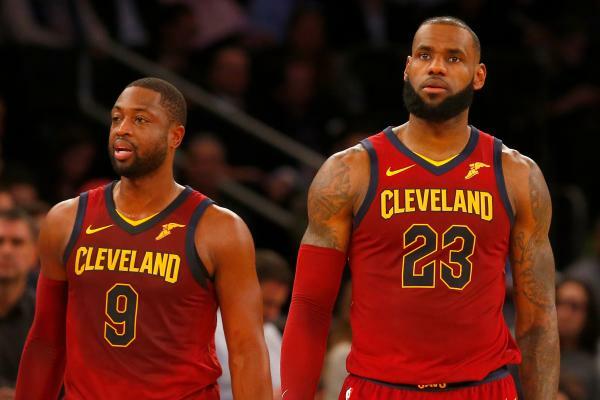 You know those rumors about how some members of the Cleveland Cavaliers weren’t too happy about Dwyane Wade latching on to their just before the season? They’re all true. Well, most of them. Or some of them. Whatever. Point is: Wade didn’t receive the warmest welcome upon his arrival, and LeBron James, one of his best friends, still seems kind of salty about it. His reception in the locker room was, at best, frosty. This cohesive unit was still healing from the Kyrie Irving trade and had recently completed a week of voluntary workouts in Santa Barbara, California, before the start of training camp. The mood was high from a positive week there. Players were quietly concerned Wade’s star power and presence might disrupt what was a terrific chemistry, particularly since popular veteran Richard Jefferson was likely to be the odd man out. The organization wondered how to make Wade fit since he was pushing to start. The fact he arrived on the eve of training camp after his buyout from the Bulls further complicated matters. Wade, of course, is in Cleveland primarily because of his friendship with James, who acknowledges now that Wade’s reception was chilly. He wasn’t the only one who wanted Wade here, but it was a short list. And how did this all make LeBron feel? The fact Wade wasn’t openly embraced bothered James. Of course LeBron feels this way. Again: Wade is one of his best friends. They entered the league together. They played for four years together. They made four trips to the NBA Finals together. They won two championships together. They started a Big Three-obsessed movement together. Wade is one of the primary reasons, if only reason, LeBron left Cleveland for the Miami Heat in the first place. They take vacations and Banana Boat excursions together. So, yeah, he’s not going to take too kindly when some of his teammates (cough, J.R. Smith, cough) aren’t rolling out the red carpet for him just because he’s 35 and eating into their minutes. Whether LeBron’s basketball interest in Wade holds any merit, however, is worth considering. Wade certainly has some juice left in him. The Cavaliers’ offense is slightly better with him off the floor, but he helped galvanize the second unit upon being relegated to the bench and has, at times, been a pleasant surprise on defense. And during their current 10-game win streak, the Cavaliers are posting top-notch offensive and defensive ratings with Wade on the floor, outscoring opponents by 16.1 points per 100 possessions, per NBA.com—which gives wade the third best net rating on the team during this streak. In other words: LeBron: 1; Disgruntled Teammates: 0.